The Missouri Republican Primary for US Senate became a four man race on Saturday when Hector Maldonado joined Sarah Steelman and Todd Akin at the Americans for Prosperity's Missouri Summit. 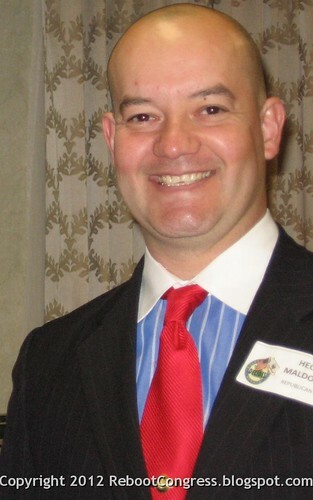 Maldonado was added to the forum when St. Louis businessman John Brunner backed out. PoliticMO reported on Friday about Brunner's withdraw from the Saturday forum in Springfield. Earlier this week the Cape County Tea Party held a candidate forum in Cape Girardeau. During the forum they conducted a straw poll for both local and state-wide offices. While Maldonado did not win the straw poll for US Senator from Missouri, he placed second besting both Brunner and Steelman. That doesn't surprise me because Maldonado ran for US Senate in 2010. While he finished fourth in that primary behind Roy Blunt, Chuck Purgason, and Kristi Nichols, he was able to develop his name recognition among conservatives across the Show Me state. In fact, I thought he won a 2010 AFP US Senate candidate forum. All three of Maldonado's primary opponents have demonstrated significant weaknesses. Steelman is a disastrous public speaker with ties to unions and trial lawyers. Brunner has demonstrated a propensity for blaming others and an inability to control his campaign spending. Akin's greatest weakness is that he'd have to defend his numerous earmarks against Claire McCaskill's strict no earmark policy. In effect, McCaskill would be able to credibly run to Akin's right on fiscal issues during the general election. Given the weak field, his respectable performance in 2010, and the fact that he seems to be garnering some interest at candidate events around the state, it is conceivable that Hector Maldonado could ride his dark horse campaign to victory on August 7th in what's shaping up to be a four-way race. I sure would like to see this man make it. Otherwise, it's Akin for me. And did I mention, there is no one without dirt to stir up...and she WILL do it! We must be prepared for that fight. In that case, vote for Maldonado! As I recall, Akin's firm support numbers are better than the other candidates, so his support will fall the least as this race becomes a four way contest--Akin benefits the most, IMHO, from Maldonado's rise because most of Maldonado's support will come from Brunner and Steelman.